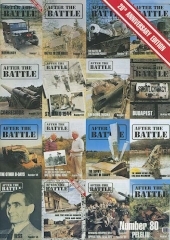 From the Editor, After the Battle, volume 80, Battle of Britain Prints International Ltd., 1993, page 2. A brief mention of my trip to London in 1991. Winston Ramsey, editor of After the Battle Magazine, kindly took me on tours of Latchmere House, the Duke of York's Headquarters, the Tower of London and St. Mary's Roman Catholic Cemetery in Kensal Green. N/A - just a brief note, along with a photograph taken in St. Mary's Cemetery.